Pioneer NAS5 review | What Hi-Fi? Pioneer has delivered a somewhat delicate product in the XW-NAS5. It also incorporates a fair bit of functionality – some useful, some not quite so useful, as we shall see. The 42cm-wide cabinet (available in black, white and silver in addition to the cherry red here) hosts two 5cm mid/tweeter drivers and a downward-firing, partially exposed 10cm subwoofer – there's also a bass reflex port on the bottom of the cabinet alongside the sub, and that's why the Pioneer has high feet. Power is rated at 15 Watts per driver channel and 30 Watts for the sub. 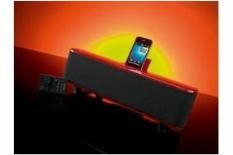 In addition to the neatly integrated iPod dock, the XW-NAS5 has generous connectivity. There's a 3.5mm input, composite and component video outputs for enjoying your iPod-stored movies on a bigger screen, and a port for an optional wireless dongle. The Pioneer's happy to stream wirelessly this way, although it uses Bluetooth rather than the less lossy Kleer technology. There's also an FM aerial socket – the Pioneer's a radio too. We're less enamoured of the XW-NAS5's remote control (a credit-card sized, clicky membrane embarrassment), its EQs (which serve exclusively to hinder the Pioneer's sound) and its pre-installed ‘soundscape' tracks, a selection of generic nature noises plus inexplicable vinyl surface-noise which can be played a) as background audio if you're terminally bored or b) mixed into your iPod music if you're quite mad. It doesn't take much of a listen to a 256kbps file of Tosca's Pony No Hassle Versions for the Pioneer to give a pretty full account of itself. Unlike a lot of Pioneer electronics, the XW-NAS5 is a resolutely safety-first device, more than happy to roll off any jagged edges hanging around the higher frequencies and equally careful to keep the low-frequency stuff under strict control. There's some method to this, of course – if those two downward-facing bass generators were given free rein you'd be unable to keep anything else on the same desktop. But the overall level of restraint isn't something we'd readily associate Pioneer with. It's not without merit: a WAV copy of Julian Cope's Paranormal in the West Country enjoys a fine unity of presentation, the sweep from the bottom of the frequency range to the top sure and seamless. Voices carry good levels of detail, and the Pioneer's reluctance to properly cut loose soothes some of the histrionics. It delivers a friendly, inoffensive sound rather than a warts-and-all expose of a song's make-up, and we'd imagine that sort of approach will find it some fans. It's not for us, though. For all the XW-NAS5's functionality, we'd rather hear the full story of our recordings. This isn't a dock that's happy to do so.